If flooding in your town is imminent, do you know where to go to stay safe? If a heat warning has been put in place, can you find the nearest cooling center to cool down? Using the Federal Emergency Management Agency‘s OpenFEMA Initiative, Appallicious created the Disaster Assessment and Assistance Dashboard (DAAD) that offers communities a tool for recovery efforts. Appallicious is a civic startup that helps governments better serve its citizens using data. Today, CEO and founder Yo Yoshida will be one of about 20 presenters at the White House Innovation for Disaster Response and Recovery Initiative Demo Day, following a speech from President Obama. DAAD, which emerged from the White House Safety Datapalooza, is a web-based (mobile enabled) application that uses data from FEMA’s open data portal. The dashboard provides a world map, where you can zoom into your town or city and find data sets. So once you click on resources and hit Police, all police stations will be labeled with a pointer on the map. Appallicious announced today that they will be launching the pilot program of DAAD in San Francisco in two weeks. What makes DAAD special is it allows community members to go into the service and add items they own that can be useful in emergency situations. 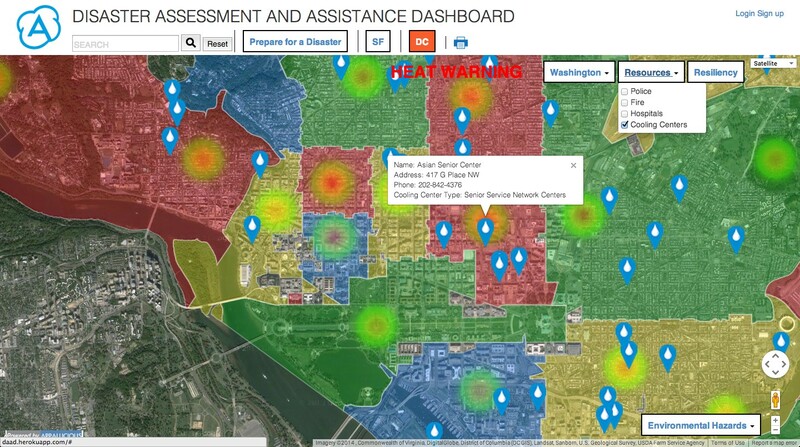 The dashboard isn’t just for community members to input data, but cities can utilize its power by addings places such as cooling centers in the event of a heat warning, and organizations can add places that people can sleep if they own large open spaces. DAAD is trying to help communities prepare for a disaster before it strikes by giving them a place to integrate their own data to empower the community, creating a sustainable economic recovery initiative that FEMA can benefit from during emergencies. You might think DAAD is useless in a post-disaster scenario if internet access is down, but the goal is to have printed manuals of these data sets and resources available in the community before disaster hits. The dashboard allows users to print anything they find useful. Today’s White House briefing will also feature the likes of Google and Airbnb. In the same vein as DAAD, Google now allows users to add data to its crisis map service and will be discussing that at the presentation.